If you’ve been following closely, you’ll know that entries closed yesterday for our free Indie Showcase space at PC Connects Seattle. Didn’t get your entry done by the deadline? Don’t worry - you still have time. And in the spirit of fair play and to ensure a level playing field for all, we’ve extended the closing date for everyone to midnight, April 26th. But that’s it - after that date, there are no extensions, no leeway and no special circumstances. None. Not one. Capiche? 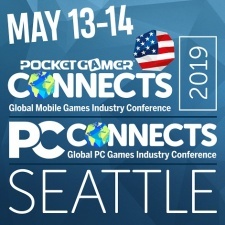 Leading B2B mobile games industry expo and conference, Pocket Gamer Connects returns to the USA May 13th and 14th, when it lands in Seattle for the first time. PC Connects is making its debut at the show, too. It’s an amazing chance to get your games in front of some of the industry’s most important and influential players from around the world. Part of the exhibition space at Pocket Gamer Connects Seattle, the Big Indie Zone has been designed to help indie developers reach investors, publishers and partners. That’s where you’ll find the Indie Showcase Tables worth $650 each - but we have a limited number of free spaces for a select few lucky indies. All you have to do is enter your details in this form before midnight on April 26th. The winners will be allocated at random once we’ve checked that you qualify as an indie. Part of an international series of B2B events for the games industry, Pocket Gamer Connects Seattle will attract 750 delegates from all around the world, including Europe, Asia and America. Away from the show floor, the conference schedule features nine tracks of seminars from 100 of the industry’s finest, covering everything from the ever-popular monetisation to the latest trends such as hyper-casual and blockchain games. Making its stateside debut in 2019, partner event PC Connects Seattle brings a further four seminar tracks exploring bringing games to market and why 2019 is the year that PC gaming changes forever. The winners get full access to both shows. For your chance to win free expo space in the Big Indie Zone at Pocket Gamer Connects Seattle, enter now!